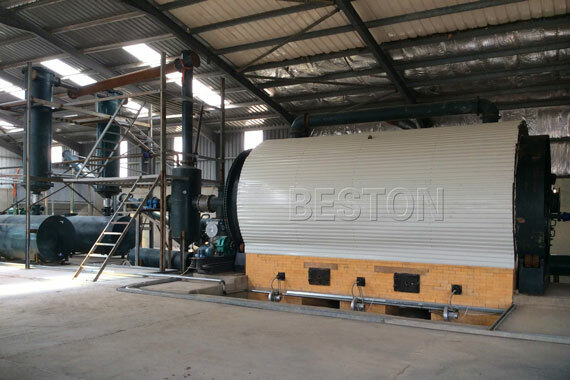 For the customers who need a small processing capacity or have small budget, our BLJ-6 & BLJ-10 batch operating pyrolysis plant is the best choice.The processing capacities of BLJ-6 and BLJ-10 is 6 MT/D, 8-10 MT/D. They can handle raw materials such as waste plastics, waste tires, waste rubber. The main feature of the batch operating plant is that these materials can be directly put into the reactor by manpower without pretreatment. 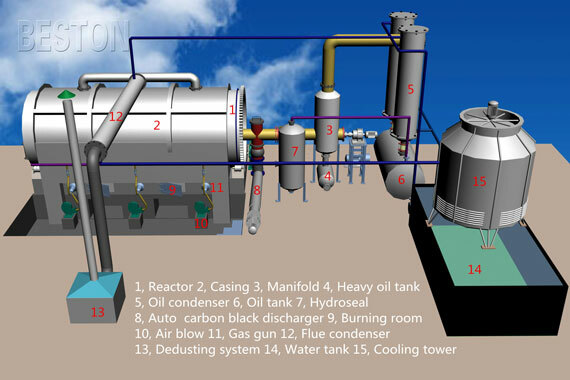 In the pyrolysis process, you can use coal, wood, or natural gas as fuel to heat the reactor. When the temperature in the reactor increases to relevant degree, the oil gas will be generated and enter the gas separator. Here, the heavy components will be liquefied and drop into the heavy oil tank. And light oil gas will rise into the oil condenser being liquefied and get into the oil tank. The unliquefied combustible gas will be recycled to heat the reactor by the extra gas recycling system. 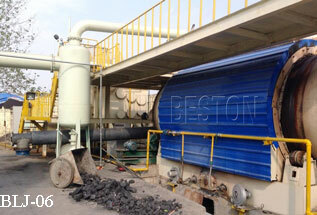 After finishing oil production, the carbon black will be discharged automatically. If the raw material is waste tire, there will also be steel wire produced. The worker can pull the steel wire out when the temperature falls. Then the reactor must be cooled before the second batch. Our plants are equipped with mature safety devices, such as alarm for over temperature and pressure, auto pressure releasing system, extra gas recycling system and fire fighting device, which will guarantee 100% safety in production. 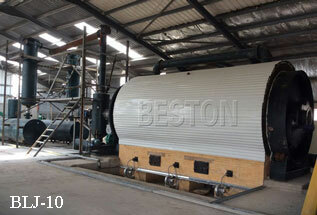 Our plants adopt special design of heat preservation which can save the energy by 40% and reduce production cost. Thirdly, high oil yield rate. Our plants adopt new type of condensers which has larger cooling area and better cooling effect, so it can improve the oil yield efficiency by 5%. In addition, the catalyzer we use is made from 24 chemicals, which can overcome the disadvantage of the traditional boiler with low oil output and bad oil quality. Our plants are equipped with advanced dedusting system (dust chemical removing tank, ceramic ring filtering system and alkali sprayers). In the dedusting system, three steps are used to dedust the extra gas. More than 95% of the dust would be removed. The released gas is pollution-free and can be discharged into the air directly. What’s more, long service life. The technology of avoiding the reactor of being burnt through by reforming the furnace, which will lengthen the life span of the main reactor for extra 2-3 years. The service life of our plants can reach as long as 5-8 years, which will save money for customers to maintain and update the plants.